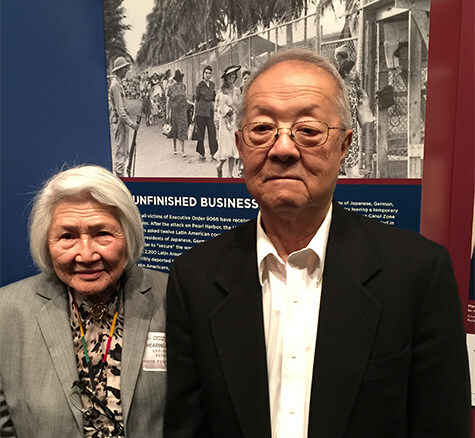 Art Shibayama, 86, was in Washington, DC and stood by the “Unfinished Business” display at the National Museum of American History. He was there with his friend, Blanca Katsura, also 86. Hear their stories on the podcast here. About 2,200 Japanese Latin Americans were rounded up and sent to the U.S., where they were imprisoned in camps waiting to be used as pawns of war in two major prisoner exchanges. On Emil Amok’s Takeout, I talk to Shibayama, a key survivor. This month, under his official name, Isamu Carlos Shibayama, he brought his case before the Inter-American Commission on Human Rights (IACHR) at the Organization of American States. He hopes the IACHR can compel the U.S. to give him, his brothers, and survivors like Blanca a proper apology and reparations equal to the Japanese Americans who were interned during WWII. Because of their foreign status, Japanese Latin Americans were offered a fourth of the monetary compensation that Japanese Americans received. Hear the stories of Shibayama and Katsura, and their fight for justice on this episode of Emil Amok’s Takeout. 8:00 Art Shibayama calls it kidnapping. 14:20 Blanca Katsura felt she was without a country. 16:11 Phil Tajitsu Nash, civil rights activist and AALDEF board member talks about the significance of the case before the IACHR. Listen to the AALDEF podcast, Emil Amok’s Takeout, on the player below. Subscribe for free on iTunes and never miss an episode! Hear them all on your phone on demand, 24 hours a day.